It has been a fantastic month in room 25! We have continued to study Manitoba in Social Studies and have just completed mini-projects on famous Manitobans. We were surprised to find so many athletes, artists, actors, politicians and other fascinating people come from Manitoba! In Science, we have begun studying the properties and characteristics of sound waves. 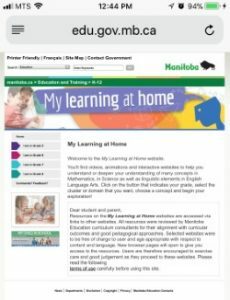 We are eager to learn more on our field trip this Friday to the Manitoba Museum. In Math, the Grade 4s have had our final quiz on data management, graphing and interpreting graph data. We have begun learning about measurement and will continue learning this topic well into November. In math, the Grade 5s have been working on multi-digit subtraction with regrouping and multiplication. Both grades have continued to work on “Spirit of Math” drills. In gym we have started learning volleyball skills and have been tested on basic movement skills. In French we are playing learning games and expanding our French language vocabulary. In Music we have already started preparing for our Winter concert! In Art we have done some painting, sketching and even created a picture with an optical illusion! Our class has now started Dance with Ms. Hamulka and some students have some serious skills! Halloween finally arrived and our class watched a spooky movie and ate a TON of snacks. We would like to thank all the parents who sent in food for our party! It is getting cold and Fall is slowly slipping away and Winter is coming! We are looking forward to snowmen and building forts even if it means coats and toques! 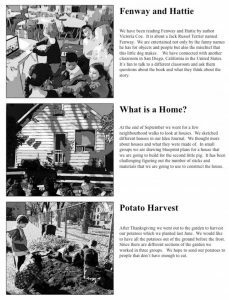 At the beginning of October we started our passion projects. We have to research something we are passionate about, for example, Afolabi is studying the planet Kepler 186f, Ivy is studying how basketball started, and Rhianna is studying how to have confidence. 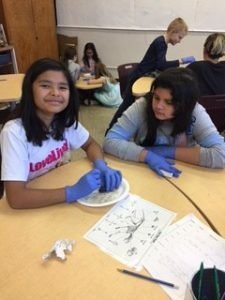 In science we started learning about the five kingdoms, Monera, Fungi, Protista, Plants, and Animals. Here’s an example for monera: Streptococcus, and here’s one for protist: Trypanosoma. 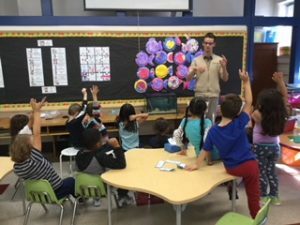 We also had a student come from the University of Manitoba WISE Kid-Netic Energy Program to teach us about Manitoba wildlife. 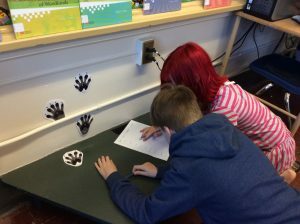 First, we had to search for footprints around the room, and match the number on the footprint to the animal we thought made it. Next we had to put on gloves and use a special instrument to cut open an owl pellet. That is the parts of the animals an owl eats that the owl can’t digest (fur and bones). We were surprised that the pellet was so round. It kind of smelled bad, but inside it was interesting. Avin and Lior found a skull of a vole. We had to use a diagram to figure out which bones we found. The Winnipeg Humane Society also came to visit our school. They showed us the different dog emotions and how they do behaviour assessments. In writing we have been working on researching organisms that are threatened and endangered in Manitoba. We also started reading the book “All Long Walk to Water” by Linda Sue Park and we did a google hangout with a school in Ottawa and a school in Chicago. They are also reading the book as part of the Global Read Aloud project. Room 21 is Saving The Earth Bag by Bag! 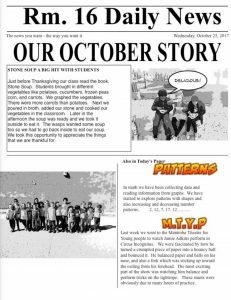 October was a busy month in Room 21! We spent some time learning why recycling plastic bags are important. Did you know it takes some plastic bags 1000 years to completely decompose in a landfill? We worked together to count and organize all the plastic bags that we collected and so far we have 1902 bags! That’s a lot of plastic kept out of the landfill! 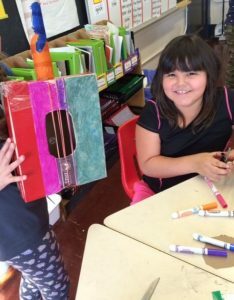 Another highlight of the month was when the students designed and created their very own musical instruments out of a variety of recyclable materials as part of their learning about sound. We experimented with pitch and volume while creating our instruments. When the instruments were complete the students had a mini jam session! Finally, October seemed to be the month to write in Room 21. We worked on using descriptive details in story writing. It was a long process from our first brainstorming session right up to completing our final copies. The students are looking forward to sharing their amazing stories about lost pets, bullying, superheroes, and much more! 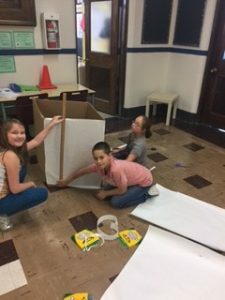 Room 14 Keeps Going Up and Up and Up! 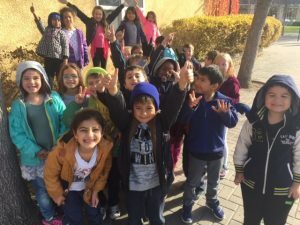 Kindergarten has had a great month! In October, we enjoyed discussing what we were thankful for during Thanksgiving. We had a wonderful time making our turkeys as our craft for the month. 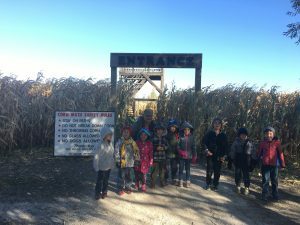 We also had fun on the field trip we took to Amaze-in-Corn! Thank you parents for your daily support and for those who came out to volunteer! 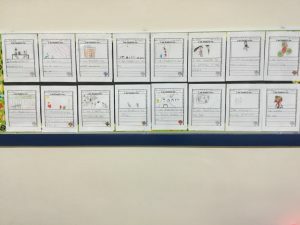 This past month we have been having a lot of fun learning about spiders. We know that they have eight legs, which makes some of us a bit creeped out. We had a chance to learn the ‘Itsy Bitsy Spider’ in Spanish. We learned that little spider never gives up and keeps going up the waterspout and that defines us as a class we keep going up and up and up! ¡El Jardin ha tenido un gran mes! En octubre, disfrutamos compartiendo las cosas en la vida que nos traen gozo todos los días para mostrar la Acción de Gracias. Lo pasamos de maravilla poniendo nuestros pavos como nuestra artesanía durante la semana de la Acción de Gracias. También nos divertimos en la excursión que hicimos a Amaze-in-Corn! ¡Gracias a los padres de famillia por su apoyo y por aquellos que vinieron a ser voluntarios! El mes pasado nos hemos divertido mucho aprendiendo sobre las arañas. Sabemos que tienen ocho patas, y me he dado cuanta que algunos no les gustan las arañas. Tuvimos la oportunidad de aprender el ‘Itsy Bitsy Spider’ en español. Aprendimos que la pequeña araña nunca se da por vencida y sigue subiendo la tubería y eso nos define como una clase que seguimos subiendo y subiendo. One of the highlights of the month of October was a visit from Sarah from the University of Manitoba Women in Science and Engineering. We played a game to match footprints to animals from Manitoba. 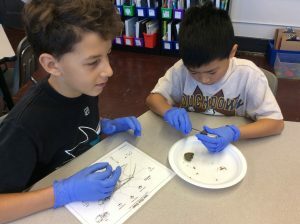 The best part was at the end when we dissected owl pellets to find the bones of animals they had eaten. 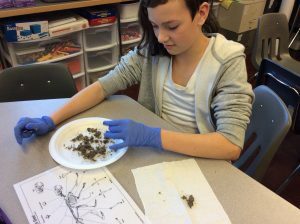 Do you know what an owl pellet is? It is owl vomit! We are studying the Earth and the Solar System. We have listed several big questions that will guide our research. One of the activities that we did was to make a sun out of orange paper that is one metre in diameter. We then used that scale to make the planets. They are so tiny compared to the sun! We were the first class to perform at assembly for the year. We did a newscast that reported on all the ways that Earl Grey School has given to others. We also explained the history behind We Day. The end was fun because Room 23 taught us the We Day Dance. Five students from Room 27 attended We Day and listened to guest speaker and musicians. They said it was a fantastic day! We are still reading A Long Walk to Water as part of the Global Read Aloud. Schools across the world are reading the same book. We were excited to do a video conference with a school in Oceanside, New York. 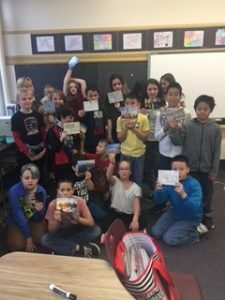 We also sent them some postcards with pictures of Winnipeg or Manitoba. It was exciting when an envelope full of postcards arrived for us from New York! In Room 12, during the month of October, we talked a lot about we are thankful for in both English and Spanish. 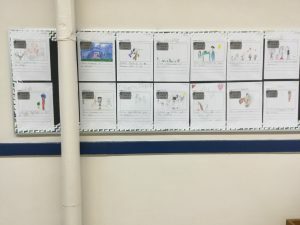 We created some writing pieces and shared them with the school on our bulletin board. We are very thankful for a lot of things we have! 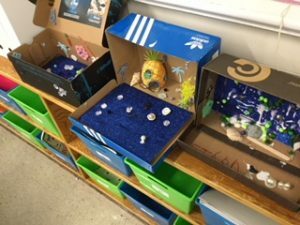 Some other exciting events that took place in Room 12 was the set up of our fish tank for our classroom pet. Petland came in to our classroom, helped us set up our fish tank and helped us investigate the different parts of a fish tank. We learned so much, that we are becoming experts on fish! We also had the Humane Society come in to our classroom to teach us about different types of pets, which tied perfectly with our theme of pets. We learned so much! 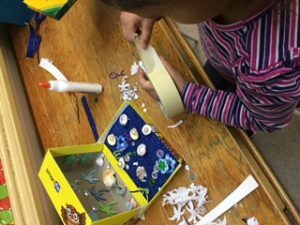 We also created fish tanks out of shoe boxes by using our creativity and imagination. 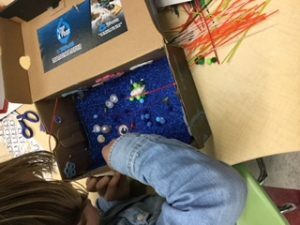 We had so much fun using different materials and using what we have learned to create our fish tanks. En el cuarto 12, durante el mes de octubre, hablamos mucho sobre lo que estamos agradecidos en inglés y en español. Creamos algunas piezas de escritura y las compartimos con la escuela en nuestro tablero de anuncios. ¡Estamos muy agradecidos por muchas cosas que tenemos! Otros eventos emocionantes que tuvimos en el cuarto 12 fue la instalación de nuestra pecera para nuestra mascota de la clase. Petland entró a nuestra clase, nos ayudó a instalar nuestra pecera y nos ayudó a investigar las diferentes partes de una pecera. ¡Aprendimos tanto que nos estamos convirtiendo en expertos de los peces! También tuvimos el Humane Society en nuestra clase para enseñarnos diferentes tipos de mascotas que se relacionaban perfectamente con nuestro tema de mascotas. ¡Aprendimos mucho! También creamos peceras de cajas de zapatos utilizando nuestra creatividad e imaginación. Nos divertimos mucho usando diferentes materiales y usando lo que hemos aprendido para crear nuestras peceras. What an exciting and busy month! 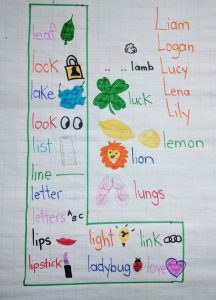 the letter L this week. We are also finishing up our work on trees and seasons this week. We have learned a lot of new words like chlorophyll and photosynthesis! 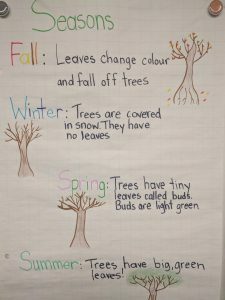 We know all 4 seasons and how the trees look at the time. We’ve learned how different animals use and help trees! We can’t wait to start a new theme next month, but Mrs. Kanaski won’t tell us what it is yet! She says it’s a surprise!!! see a play called “Circus Incognitus”. It was a one-man show where a circus performer did all sorts of tricks. He only spoke a few words such as “Hello” and “magic”. He did tricks that included walking on a rope that was raised above the stage, riding a bicycle that was way too small for him, juggling with rings and changing a piece of paper into a bouncing rubber ball! The man acted very goofy when he was pretending to be a fish before he did a big jump into a big, brown box. We got scared when his ladder broke into two pieces and we thought he was going to fall down! Instead, he started walking across the stage using the ladder pieces to move. We can not wait for our next visit to MTYP in December!